This past Friday, I ended my 20+ year dependency on wearing glasses to see. And while there's a lot of healing that remains as I write this, my vision is already better than with my old glasses. I started my adventure by selecting a LASIK center near me. I was not necessarily interested in the lowest cost provider, but since I was using my Flexible Spending Account to pay for the procedure, I had a hard limit as to what I could afford. The doctor that owns this particular business is from the Cleveland area, and comes to Toledo once a week to perform the procedure. He comes well recommended, and has an impressive resume of experience. The next step was to attend a free consultation. Not everyone is a candidate for LASIK surgery, so pre-screening is required. Aside from needing corneas that are thick enough to be reshaped, you also need to have a stable eye prescription. There's no sense in performing surgery if your eyes are just going to change in a year or two! As you could have guessed, I "passed" this pre-screening, and was invited back for an official pre-operative examination (and to make a lump sum payment that covers the procedure itself, as well as all pre- and post-operative exams). But first, I also had to decide what technologies I wanted to use. You see, LASIK is sometimes referred to in endearing terms as the "Flap and Zap". The surgeon cuts a thin flap of your outer cornea that resembles a contact lens, only it remains attached at the top. The laser then reshapes the newly exposed layer of the cornea to correct your vision, and the flap is replaced. By preserving your original outer cornea, the healing is extremely rapid, and the resulting vision is supposedly better than other types of refractive procedures. There are two ways that this flap can be created: by means of a specialized blade device, known as a microkeratome, or by a special type of laser. As you can imagine, there's a price difference between the two. Despite being used successfully millions of times since the inception of LASIK, the thought of the microkeratome scared the hell out of me. With this, a contraption is placed precisely over your eye, and then an oscillating blade passes over the cornea, making a cut that results in a flap that is about the thickness of two human hairs. The more attractive (and more expensive, by about $500 per eye) method uses a femtosecond laser that scans across the flap area. The beam is focused to just under the cornea, and is only active for one billionth of one millionth of a second per pulse. Each pulse vaporizes a tiny portion of the cornea at the point of focus, causing a tiny bubble to form. These bubbles start joining with adjacent bubbles, much like soap bubbles in the sink, until there is just one big bubble remaining. In the end, the flap is freed from the cornea by lasering the outer ring. Because IntraLase is the company that manufactures the FDA approved "laser microkeratome", this procedure is referred to as IntraLase. 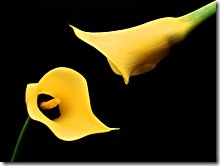 The other pricing decision involved selecting either standard LASIK or custom wavefront LASIK. Eyeglasses and contact lenses are able to correct certain vision problems, known as higher order aberrations, and they do this in a standard way. People with the same prescription can actually share each other's spectacles and are then able to see just as well as when they wear their own. With standard LASIK, the "generic" correction is made to your eyes, and the results would be the same as if you were wearing your glasses or contacts. However, there are other subtle deformities known as lower order aberrations that can make two people with the same prescription have different sight problems that are generally left uncorrected by glasses. Custom wavefront LASIK takes a personalized mapping of your cornea, and as the name suggests, creates a custom reshaping just for you. Again, it adds about $500 per eye over the standard (because the equipment manufacturer charges the facility more to use the custom mode, and this cost is simply passed onto the consumer). In my case, I was able to afford the IntraLase and the custom wavefront, so that it what I ultimately decided on. My pre-op exam was on Monday, March 3rd. I knew that I would have to have my eyes dilated, so I took the day off of work. When I first arrived, I was taken back to an examination room where my current prescription was determined ("better 1, 2" "3, 4", etc). It turned out that my prescription had changed in the past 7 years, and I was only seeing at about 20/40 with my glasses. Who knew?!?! Next, I was taken across the hallway and all of the same cornea measurements that were take during the consultation were repeated. The computers produced identical results as before, so they had good numbers to program into the laser. After that, it was time to watch a video to inform me of risks, sign paperwork, and wait for the eyedrops to work their magic and cause my irises to disappear. When my eyes were fully dilated, I went into a different examination room and given a full optical exam by an ophthalmologist. This involved repeating the "Better 1,2" test to ensure that her numbers matched the previous person's results, as well as an examination of my retina and whatever else they do as part of a full workup. Then, it was done. I was given a prescription for Valium and Zymar eye drops, as well as some eyelid cleansing pads (I had to disinfect my eyelids every evening leading up to the surgery), and sent home to sleep! Awesome! I arrived on Friday, March 7 wearing a Red Gate T-Shirt (the alternative would have been a Developer Express shirt, but are you really interested in my choice of apparel?). Right away, I was instructed to take the two Valium pills that I brought with me. Then, I was taken back to a dimly-lighted waiting room with Lay-z-boy chairs and Men In Black II playing on a large television. My eyelids were sterilized with betadine, and surgical booties were placed over my shoes. I also got an awesome hair net, and was not permitted to put my glasses back on. So, there I sat, listening to the movie - because there's no way that I could see it. The operating room was separated from this waiting room by means of sliding glass doors. They had a television placed facing the waiting room, presumably so that loved ones could watch the procedure taking place from the laser tracker point of view. Despite my blindness, I could tell what was happening on this TV, and watched as the person ahead of me had the procedure done. I had never taken Valium before, but my butterflies never went away. I wonder how bad they would have been without the sedative!jQuery15206081989678969336_1341772668724! Before I knew it, it was my turn! I was led into the room, numbing drops were placed in my eyes, and then I was positioned on a bed (table?). The IntraLase device was on my left, and the excimer laser was on my right, and by swinging the bed, my eyes were able to be placed under the appropriate devices. I was handed a teddy bear with surgical scrubs (and a face mask) to hold onto. How cute! The surgeon covered my left eye with a pad of some sort, and then placed a ring over my right eye. This device used suction to adhere to the whites of my eye, and served to hold open my eyelids and keep my eye from moving. The pressure caused by the suction made my vision fade out, so I couldn't see anything. Before I knew it, the laser tech was counting down how many seconds were left before the flap was complete. Then they covered the right eye and repeated the procedure on the left. With the flaps being cut, the suction devices were removed, and I was positioned under the excimer laser. The surgeon carefully retracted the flaps, and I was staring up at a blurry orange light with a ring of LEDs surrounding it. He taped my eyelids open, but essentially, I could look around if I wanted to (the computer scans your eye hundreds of times a second, and can track the laser precisely - still, I focused my gaze on the centermost blurry light). 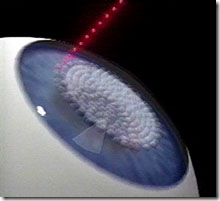 There was zapping sounds as the laser started to vaporize my cornea in order to reshape it. There was a smell, as you can imagine, and it reminded me of ozone and burning hair combined. Again the laser technician was counting down the seconds until the laser was complete, and in the last 3 seconds, that blurry light that I had been staring at came into focus! After both eyes were complete, the doctor placed what seemed to be 20 drops from a handful of different bottles into my eyes. Then, I sat up. The clock on the wall, which I could see, revealed that the entire procedure on both eyes took a little over 10 minutes. My last stop was in the ophthalmologist office. The eyechart revealed that I was about 20/80 or so with my brand new eyes. The surgeon used the equipment to examine the positioning of the flaps, and said that everything turned out great. 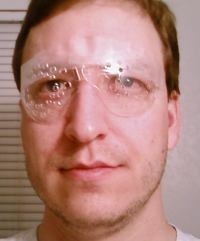 The ophthalmologist gave me an assortment of drops and eye shields and sent me on my way to go home and sleep. At home, I took Tylenol every 4 hours for the discomfort (which would probably have been quite tolerable without taking anything, but I didn't want to chance it). 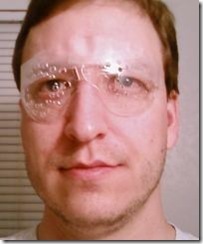 I also had to put medicated eyedrops in my eyes every 2 hours, and wear the eyeshields (and sunglasses, by my choosing) for a few days to keep me from accidentally rubbing my eyes. I remained amazed at how quickly my vision sharpened up, and by Friday night, I was watching TV in my darkened bedroom. On Saturday morning, while everyone else in Ohio was getting blasted by a blizzard, I drove myself in to the center so that the ophthalmologist could do a follow-up exam. Everything was healing nicely, and my vision was 20/25 (!!!!). I continued to gaze at my surroundings, amazed by just how clear everything is (and getting crisper every day, it seems). There are periods of time when my vision will blur up for a little bit, but this is chiefly attributed to the flap not being a perfect fit yet for the resurfaced cornea. I have about another 1-3 months until everything is completely healed, and can expect my vision to get worse at times. The LASIK center offers a lifetime guarantee, and will perform another touch-up surgery if my vision degrades beyond 20/40.